Our Chef Carlos Julián, responsible for Ampar Restaurant, shares his special way of presenting and taking advantage of the Cocoa Pod in one of his desserts Star “Chocolate in Textures”. 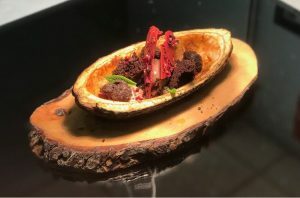 Carlos Julián for this dish uses natural cocoa, both the pod and the rest of this fruit and also uses Chocolate la Giandujia. After the preparation of the dish, it combines different textures in different temperatures at the time of placing it in the same pod from which part of the dish has been extracted.